Real gross domestic product edged down 0.1% in November, partly offsetting an increase of 0.3% in October. 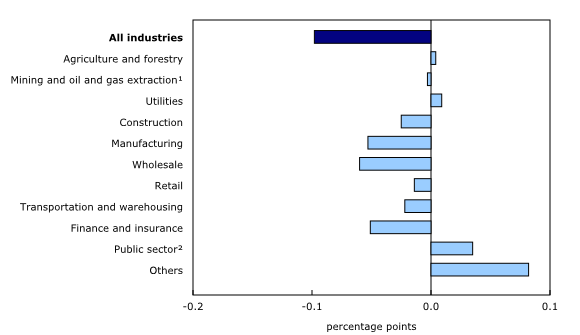 Decreases in wholesale trade, finance and insurance, manufacturing and construction more than offset gains in 13 of 20 industrial sectors. Goods-producing industries were down 0.3%, the third decline in four months, while services-producing industries were essentially unchanged. The wholesale trade sector decreased 1.1% in November, more than offsetting October's growth, as six of the nine subsectors declined. Down for the second time in the last three months, machinery, equipment and supplies wholesaling contracted 2.1% in November as activity in the majority of wholesaling industries declined. Miscellaneous wholesaling was down 2.1% after three months of growth, on lower wholesaling of paper products and other miscellaneous products. The building material and supplies wholesaling subsector (-1.4%) decreased for the fifth time in six months, reflecting lower construction activity over this period. The manufacturing sector contracted 0.5% in November, the third decline in four months, as the majority of subsectors were down. Non-durable manufacturing declined 0.3% as five of the nine subsectors contracted. Petroleum and coal products manufacturing (-2.2%) contributed the most to the decline as output of petroleum refineries decreased, from maintenance and turnaround work at some refineries and lower production at other refineries. Food manufacturing was up 0.9% as higher output of grain and oilseeds milling (+9.4%) contributed the most to the increase. Durable manufacturing was down 0.7% in November, with declines largely concentrated in transportation equipment (-2.7%) and machinery manufacturing (-2.9%). In the transportation equipment subsector, motor vehicle assembly was down 5.9%, largely due to atypical retooling and production schedules at some assembly plants. The decrease in assembly activity was also a contributing factor to the 5.6% decline in motor vehicle parts manufacturing. The decline in machinery manufacturing came from lower output of other general purpose machinery manufacturing and agricultural, construction and mining machinery industries. The finance and insurance sector declined 0.7% in November, offsetting much of the 1.1% increase in October. Following high activity in October, bond and equity market activity declined in November, contributing to decreases in financial investment services, funds and other financial vehicles (-3.5%) and depository credit intermediation services (-0.5%). Insurance carriers and related activities were essentially unchanged. The construction sector declined for the sixth consecutive month in November, contracting 0.3% to fall to its lowest level since the middle of 2017. Residential construction fell 1.0% as construction of single and semi-detached housing units, along with home alterations and improvements, continued to decline, while there were gains in row and apartment-type dwellings. Non-residential construction was down 0.7% as growth in industrial and commercial construction was more than offset by declines in public and other non-residential construction. Engineering and other construction (+0.2%) and repair construction (+0.2%) were both up. Activity at offices of real estate agents and brokers (-2.8%) decreased for the third consecutive month, on lower housing resale activity in Ontario and British Columbia. Transportation and warehousing declined 0.5% in November, the third decrease in the last four months. Following a 2.4% drop in October, the output of postal services and couriers further declined 4.5% in November, as rotating strikes at Canada Post continued until November 27 when employees were legislated back to work. Truck transportation was down 0.9%. Pipeline transportation decreased 1.0% on lower movement of natural gas as well as crude oil and other types of pipeline transportation. There were increases in rail transportation (+2.8%), warehousing and storage (+1.5%) and air transportation (+0.3%). Retail trade decreased 0.3%, as 5 of 12 subsectors were down, continuing the weakness of recent months. 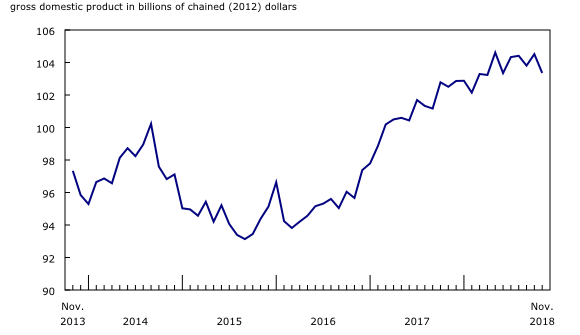 The retail trade data in this release do not include the activity of cannabis retailers, which began operating following the legalization of retail sales of cannabis for recreational purposes on October 17, 2018. Contributing the most to the decline was lower activity at motor vehicle and parts dealers (-2.0%) in November following two months of growth. Building materials and garden equipment supplies and dealers (-0.4%) posted a sixth consecutive decline. Activity at types of retailers generally associated with Black Friday and Cyber Monday promotions, such as general merchandise stores (+2.0%), electronics and appliance stores (+2.8%) and clothing and clothing accessories stores (+0.4%), was up. Non-store retailers declined 3.8% as reduced activity at fuel dealers offset the increase for electronic shopping and mail-order houses. The mining, quarrying and oil and gas extraction sector edged down 0.1% in November, as increases in mining excluding oil and gas extraction and supporting activities were more than offset by a reduction in oil and gas extraction. Mining excluding oil and gas extraction expanded 2.3% in November, partly offsetting the 4.6% decline in October. Non-metallic mineral mining was up 4.2%, largely as a result of a 5.2% increase in potash mining. Metal ore mining edged up 0.2%, as a 6.5% growth in copper, nickel, lead and zinc mining was partly offset by declines in other types of metal ore mining. Coal mining increased 5.2% in November, up for the fourth time in five months, driven by foreign demand. Oil and gas extraction contracted 1.6% in November. Conventional oil and gas extraction was down 2.2% as both crude petroleum and natural gas extraction decreased. Crude petroleum extraction was affected by an intense storm off of Canada's East Coast which affected all offshore drilling activities and damaged some oil and gas production, storage and offloading facilities. Non-conventional oil extraction decreased 0.9%. Following three months of decline, support activities for mining and oil and gas extraction were up 2.4% on account of higher drilling services. Accommodation and food services rose 0.6% in November, as both accommodation (+1.2%) and food services and drinking places (+0.4%) grew, led by full-service restaurants and special food services. 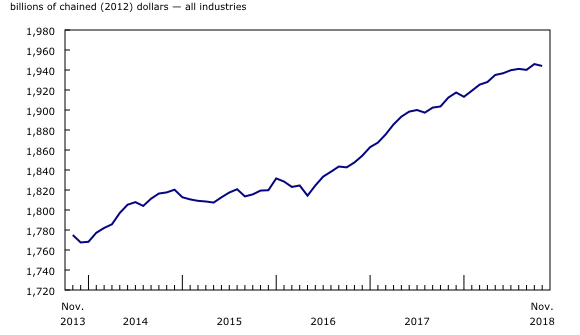 Professional services, which have increased every month since July 2017, edged up 0.2%, led by architectural, engineering and related services (+0.6%) and computer systems design and related services (+0.4%). Utilities increased 0.4%, as a 0.5% gain in electric power generation, transmission and distribution was partly offset by a 0.2% decline in natural gas distribution. The public sector edged up 0.2%, with all three components (education, health care and public administration) increasing. For more information on GDP, see the video "What is Gross Domestic Product (GDP)?" Real-time table 36-10-0491 will be updated on February 11. Data on GDP by industry for December 2018 will be released on March 1, 2019.